Arsenal made history by becoming the most successful club in the oldest football competition on Earth. This was Arsenal’s 12th FA Cup final win and it was probably their easiest as they came up against an Aston Villa side who were outclassed in every area. Arsene Wenger chose an asymmetric 4-2-3-1 formation with the biggest surprise probably being the selection of Theo Walcott as a lone forward. Fellow Englishman Danny Welbeck was injured and there were rumours that Giroud had some sort of allergy problem in midweek however I think Wenger would have chosen in-form Walcott regardless. Sherwood played a formation that was somewhere in between a 4-3-2-1 and 4-3-3. The base formations of the two sides. Arsenal played 63 long passes in the match (14%) compared to just 24 long passes (3%) in their match earlier this month against Sunderland. They finished that match 0-0 with Giroud playing the whole match. Arsenal won the last game of the league season 4-1 vs West Brom with Walcott scoring a hat-trick and therefore Wenger chose Walcott to play in the final. When interviewed prior to the match, Sherwood seemed slightly surprised that Walcott was chosen to start as a lone striker and he set up his Villa side to press fairly high in the final third. This high press worked very well at times in the first half. They performed more of an option-based press until they made sure they could press the man on the ball whilst maintaining sustainability in the rest of their press. The above is a perfect example of that. They targeted Mertesacker and Szczesny in particular as they are two players who can’t really pass a ball more than fifteen yards that would beat a press. While it was good at times, the press was also sometimes detrimental to Villa and the double pivot of Coquelin and Cazorla were key to beating the press. 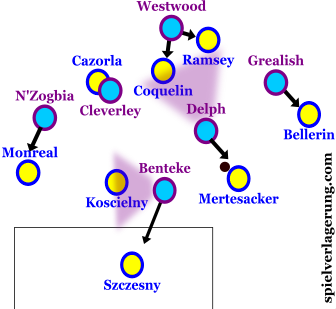 Cazorla would sometimes drop deep to create superiority in these areas to help pass their way out the press, alternatively the ball would be played to him with his back to goal where he would use his technical superiority over Cleverley to beat him and then look to play it forward or wide. This high press completely played in to the Gunners’ hands when it was broken as they could move up the pitch quickly, suiting Walcott. Arsenal played in a 4-4-1-1 shape in defence with Mesut Ozil as a no. 10. This is a defensive shape that is very useful in attacking transition and Arsenal utilised this, getting the ball to Ozil who would look to thread balls into the space behind the defence to Walcott. Ozil was key to Arsenal’s direct play. Arsenal dominated early possession however and some of the negatives of Walcott’s selection were shown. He missed a couple of good chances from close range that a more orthodox centre-forward would probably put away. Also, a lot of Arsenal’s final third play was crossing-based. Walcott doesn’t really suit this type of play. In response to this, Wenger switched Walcott and Sanchez about 35 minutes into the game. Just four minutes later Sanchez jumped brilliantly to win a header from a Monreal cross, Walcott ran into the area from deep and smashed it in to put Arsenal 1-0 up. Straight after the goal, Walcott went back up top. Walcott became more and more of a threat as Arsenal kept scoring and Villa became more committed in attack. 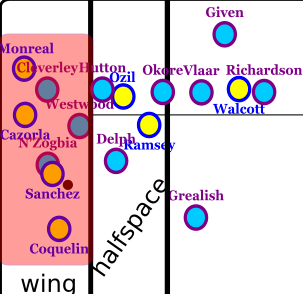 Most of Arsenal’s middle and final third play was oriented on a left-wing where Cazorla, Ozil, Sanchez and Monreal often found themselves in close proximity. With these four players up against N’Zogbia, Cleverley, Okore and Hutton there was only ever going to be one winner. 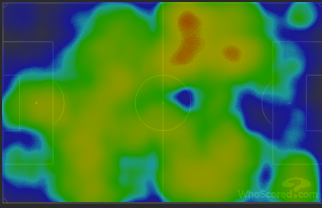 Arsenal’s heatmap showing their left-wing orientation. Arsenal utilised this left-wing superiority either through switches from the right side to the left where they would have a overload or they would play straight through this left side of the field, overloading the wing and using quick combination to get behind the Villa defence in wide areas and put crosses into the area. Arsenal overload the wing 4vs3. Ozil and Ramsey occupying Hutton and Okore in the halfspace also restrains them from closing down Monreal when he gets the ball behind Cleverley and looks to cross. Aston Villa defended in a rigid 4-1-4-1 shape in the middle third. They were position orientated and their wide players showed no regard for onrushing Arsenal fullbacks, allowing balls to be played into these fullbacks behind the midfield four, allowing Arsenal to develop 2v1 wide overloads. Westwood often would get carried away with pressing and move into the line of four, leaving masses of space between the defensive and midfield line. Aston Villa’s very horizontally compact midfield in the defensive phase worked well at times in the first half however isn’t ideal against a team like Arsenal who are very good at quick passing combinations, beating men with dribbling and putting balls through an eye of a needle. 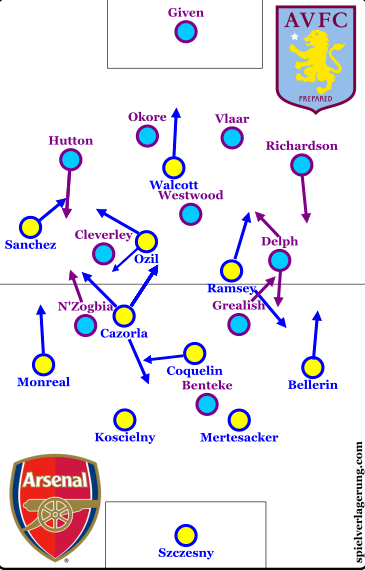 Arsenal exploited it better in the second half, getting both fullbacks up high and switching between them, stretching Villa. Aston Villa were absolutely dreadful in attack. They didn’t have a single shot on target all match (two shots off target), they were harmless in attacking transition which is the main area you can hurt Arsenal, and their final third play was one-dimensional. Their whole attack was aimed at crosses towards Benteke. The crosses were always those horrible floaty, slow balls which Szczesny collected well if Benteke was up against Koscielny. Mertesacker dominated Benteke in the air not only in his own penalty area, but at the other end too, peeling off Benteke’s dreadful marking to make it 3-0 Arsenal twelve minutes after *that* Sanchez goal made it 2-0 to the Gunners. When Villa played it wide and pulled Arsenal’s full-back out, Coquelin moved into the empty halfspace and made sure Villa couldn’t find any space on the inside. Arsenal were deserving winners in the end and rounded off a fairly successful season for Arsenal in comparison to some of their recent campaigns. There was a lot of talk as soon as the final whistle was blown as to whether their performance showed that they could challenge for the Premier League next season (a lot of said talk was by people that often complain about the cup’s decrease in significance) and personally, I think a comfortable win against a side that played as badly as Aston Villa did means absolutely nothing. They are still about £70m in the transfer market (or a new manager) away from winning the Premier League title. Can you please be more explicit? Which new manager could lead this team to the title? Or which £70m player(s)? Firstly, I acknowledge Wenger has been a fantastic manager for Arsenal and continues to be. I just think that they will not win the league with him in charge. Only a select few managers could lead Arsenal to the title and I think Pep or Klopp would be the best candidates to win the title in the first season at Arsenal however I would love to see a coach such as Montella, Laudrup or Sampaoli to be given a chance to prove themselves at Champions League level. In terms of signings, I would like to see a deep midfielder (Busquets, Gundogan or even Romero [3 different players I know]) and a centre-forward (Benzema, Higuain or Bacca). Maybe a full-back or a centre-back would come in handy too. I don’t know but is there not a better translation for Halbraum than halfspace? There have been lots of discussions on this and nobody has really come up with anything better. “Inside flank” and “2nd + 4th columns” are the best alternatives. For me then half space is often defined by the channel between full back and center half. If I fall over a better word than half space, I’ll make a campaign to rename it. Maybe ZM already has a better word, I’ll check. I hear the term 2nd column the first time. That is way to theoretically. If you are not a sport scientists reading / writing a thesis with a definition about how the pitch is devided into rows and columns, it only confuses the reader. Roughly 80 years ago, the Germans adopted the term ‘wing half’ from the English game. At that time, the 2-3-5 was a common formation and the line of 3 players in midfield were called halfbacks. The two outer half-backs were known as ‘wing halves’ and the central halfback became known as the ‘centre half.’ Eventually ‘wing halves’ evolved into Halbläufer, or half runners, and the space they operated in became known as the Halbräume or half-spaces. You’ve decided to call the channel between the fullback and center half the half-space. The channel is a dynamic amount of space between those two players. The half-spaces are static sections of the field. I’ve never heard someone using “Halbraum” or “Half Space” as the term between full back and center back. Until now, that is. Good images as always on this site and always unique, but the writer clearly doesn’t watch Arsenal often at all. Pre game he didn’t even know what formation Arsenal play or Cazorla’s current position, but then all of a sudden he knows ‘Mertesacker can’t pass through a press’? Mertesacker is Arsenal’s defensive outlet, and as dumb as that sounds for someone who’s 6ft6, it’s true. Cazorla obviously the main one in this new role when he drops really deep, but Coquelin avoids possession, Bellerin pushes high, Monreal (usually) and Koscielny sit back and allow Mertesacker to bring the ball out. Criticising Szczsesny for the same thing as well. If you criticise Szczesny for that, then every keeper in the world barring the very best with the ball at their feet, like Neuer, Ter Stegen and Bravo (obviously a few more as well) should be criticised. Anyway, my point is he’s good with his feet for a keeper and it’s such an easy thing to say when you’ve got nothing of substance to write about for Villa. If you haven’t got anything to write, don’t write anything. Claiming there was this amazing game plan from Sherwood to target these two players with such an organised press which was apparently effective in the early stages when it clearly wasn’t is mental. It wasn’t a plan to target them, it’s just Delph always pushes on and presses. It’s lazy writing. Should be able to tell the difference between a tactical ploy and a player trait. Arsenal weren’t “more direct than usual” either, the long passes were just switches of play. Picking the Sunderland game was totally different as we were the home team in a game they dropped off. Obviously there’s not gonna be many switches. Arsenal have been more direct this season than any other for a long time. This wasn’t a one off. Our possession stats are probably the lowest they’ve been under Wenger and especially in the 2nd half of the season where we’ve actively looked to invite teams on and counter like we used to in the early 2000’s. The writer has made it up based on the image of Arsenal rather than actually watching us play. I like the site, probably more than any other for football analysis, but this has been written by someone who continually writes most of his opinions to fit around the game rather than letting the game speak for itself. I agree Arsenal need to spend money to be a title contender, anyone can see that, but “or a new manager” when he doesn’t watch Arsenal or understand our expectations. We have the fourth highest wage bill (which is the most accurate way to judge the expected position which almost all analytics people would agree with) but yeah he only finished 3rd and won the cup, what a crap manager. I’m not saying he’s in the elite or he’d ever win a Champions League with Arsenal, but only a handful of manager have got into the top 4 with a wage bill of 5th or less and most of them are Wenger when building the stadium. He’s just won 2 F.A Cups on the bounce and finished 3rd when almost all pundits for some reason predicted us finishing 5th, but yep, Wenger underachieving again. Nothing to do with not having the squad or funds for years. Fully aware you probably won’t publish this as it’s criticism but i’d at least like you to keep an eye on the writer. This is probably the best football site and every other writer is significantly better. Thanks for you constructive feedback David, I’ll take it on board 🙂 Please link me your analysis of the match so I can see how to improve. No need for a link, he went into details.